This private Cabo San Lucas retreat offers exclusive luxury villas, surrounded by stunning landscapes and beautiful ocean views. This all-inclusive gated resort community offers luxurious three-bedroom villas, each with a private infinity pool, indoor and outdoor jacuzzi, maid and butler service and unlimited access to the restaurants and bars. Guests can enjoy world-class dining with a variety of delicious options at Cibola and the Steakhouse at Quivira. 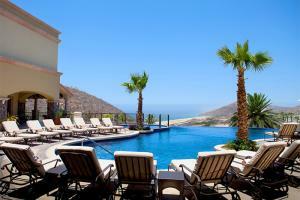 Located in Cabo San Lucas, about 28 miles from Los Cabos International Airport.